Holy moly. These Caprese burgers. Like a late summer farmer’s market collided with your local Italian butcher. All the best summer flavors (heirloom tomatoes and fresh basil leaves), a thick meaty-burger fortified with egg yolk and finely grated parmesan, an oozy layer of burrata and a bright pop of flavor from the lemon-basil aïoli. And the bacon rounds, let’s not forget the bacon rounds. I saw @thejudylab make cross-hatched bacon squares so that every bite of her BLT would have a hunk of bacon in it. Isn’t that genius? 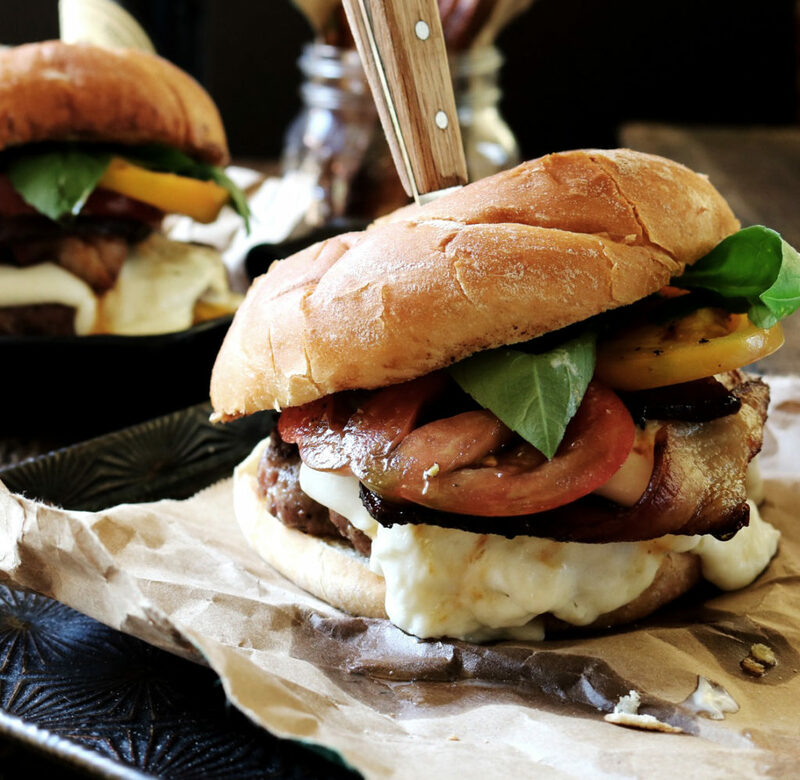 We’re doing similarly here, so that every bite of these Caprese burgers has a thick layer of bacon in it. All the feels. Aside from eating Caprese burgers and lots of cookies and wonder how I’m going to fit exercising into my day (I seem to muse on this a lot…I’ll let you know when I find the answer), I’ve been focusing on organization. I took a class when I was in college and it was called Be Here Now. I’m not kidding. The whole thing was about being organized so that you could be present in life (without constantly mentally reviewing that laundry list of crap that needs to get done). This class helped me SO MUCH. If I don’t set out a plan, I won’t get anything done. Like legit, nothing. Suddenly I’ll be watching hours of Housewives knowing that I should be doing something but not quite recalling what that something was. Whether you have kids or not, August/September is a built-in reset button. We’re entering the last quarter of the year and who doesn’t want to nail it? To stay somewhat focused, I always set yearly, monthly and weekly goals. The yearly ones happen in January (standard). Then the weekend before the start of a new month, I created goals for the upcoming month. They can be about recipe ideas, career goals, classes I want to take, parenting, exercise…whatever areas in my life that I want to excel at. Then, I break it down even more. Every Sunday I write a weekly to-do list and break it down by day. It can have mundane stuff on it (like laundry and going to the grocery store) to larger, big picture stuff like setting aside one hour to research and sign up for photography classes (or whatever I currently want to work on). It helps me get the minutia done, as well as chip away at the larger stuff. If I didn’t do any of this, I wouldn’t be writing this blog post right now. In these last few days before school starts, the kids and I would be mindlessly wandering around some store buying stuff we don’t need and I would just know that I was supposed to be doing something, but I would have no idea what that something was. BUT, since I have a schedule to work from, I know that I need to work all morning (I’ve been at my computer since 6am) and by noon, I’m cutting myself off and THEN the kids and I can mindlessly wander around and buy stuff we don’t really need and I’ll know I’ve taken care of everything today. Is this helpful or annoying? Because I can see how it could be both. I’m seriously going somewhere with this. SO, this past Sunday night while I was doing my weekly planning I started something new…and that was weekly meal planning. I made a document for my grocery list and a HUGE list of meals that everyone in the family likes for Breakfast, Lunch and Dinner. While I love to work with food, when it comes time to feeding everyone in the house I sometimes phone it in (read: 90% of the time)…and this is one area I’d like to improve on. My plan is to start a Sunday blog post that will cover weekly meal planning. I might share an idea (like one of my favorite things is to roast a tri-tip on Monday, tri-tip tacos on Tuesday and then chili with the leftovers on Wednesday). Or I might give links to recipes I’ll be using over the week or it might be a really quick, weeknight recipe that I think everyone in your house will love. What do you guys think? 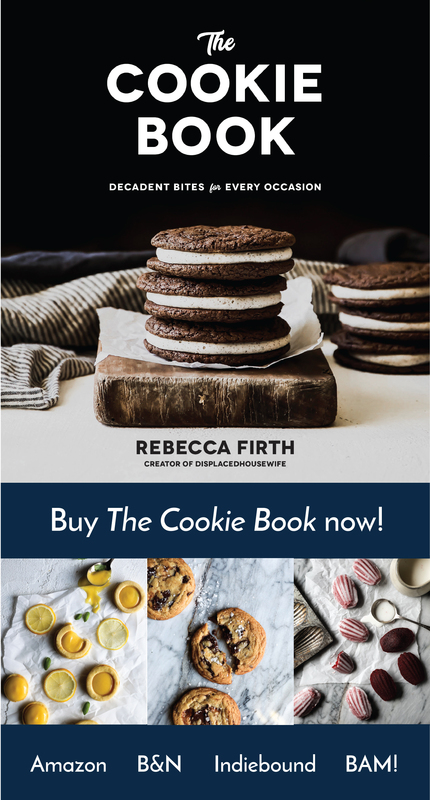 It’s kind of like Shut Up & Eat (look under R E C I P E S and you’ll find my Shut Up & Eat recipes), but might contain more than just one recipe from me or recipe ideas from other sites. PS If you and I were to meet and have martinis you would find this scheduling-goal stuff surprising because I come off all ‘let’s get more nachos and another round’! But if I didn’t do this, none of the great things that have happened in my life would have happened. I’ve learned one thing (well, hopefully a little bit more than that), but one thing that’s relevant to this… Rarely will someone run up to you and hand you what you want. You have to picture what you want, write it down, break down the steps to getting there and make it happen. Don’t settle for less. You deserve everything you want and more. I’m channeling Tony Robbins right now. …dropping the mic. OK, let’s make Caprese Burgers. *Stella also recommends adding a drizzle to your burger! Preheat your oven to 400 degrees F. Line a baking sheet with foil and spray with non-stick. Set aside for the bacon in Step IV. In a large bowl, mix the beef, egg yolk, parmesan cheese, sea salt and pepper until just blended. Divide into four equal size patties. A tip on patty shaping…first, don’t overwork your meat. Try to make it the same size in the center of the patty as it is on the outer edges. Also, try to make the outside of the patty have 90 degree angled edges…if they’re too thin they will overcook while the middle of the patty stays undercooked. Lastly, make the circumference bigger than you think you should, to allow for shrinkage. Put the patties on a plate and set aside. 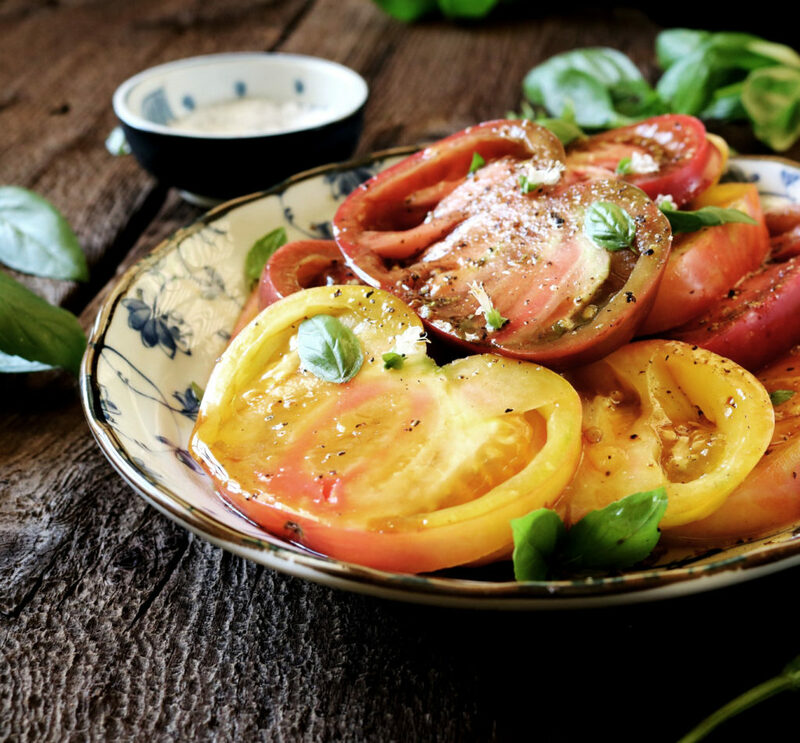 In a small bowl, place your sliced tomatoes, drizzle with olive oil + balsamic and dust with the salt and pepper. Turn them over several times to make sure everything is evenly coated. Grab your six slices of bacon. Cut two of them in half. 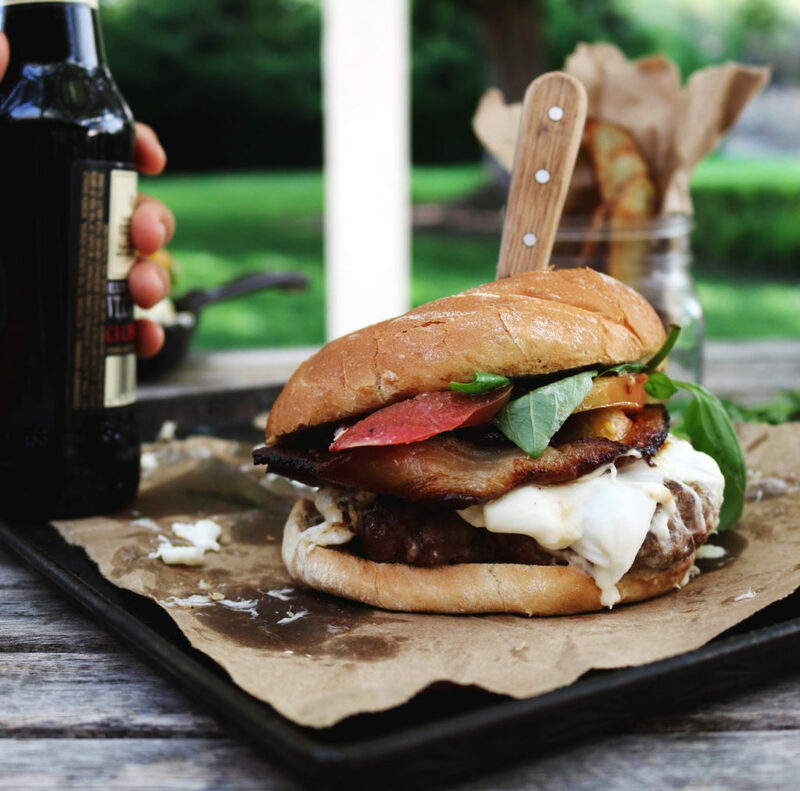 Wrap one, full slice of bacon in a circle (about the size of your burger bun) and place on the foil-lined baking sheet. Lay a half piece of bacon on top of the bacon round, to close the circle (does that make sense?). Keep in mind you want every bite to have bacon, so try to make it as circular and even as possible. Put in the middle rack of the oven and bake for about 10-15 minutes. When done, set aside. In another small bowl, mix together your aïoli. Stir together the mayo, Greek yogurt, basil, lemon juice + zest, garlic, sea salt and pepper until well blended. Set aside. Either heat up your BBQ or a large cast iron skillet (or whatever you have, those are my preferences). Get your skillet screaming hot and then turn it down to medium high. I drizzled a wee bit of olive oil on there to keep things moving. Put your patties in the pan and you want to hear a hiss. If you don’t hear that, take the patty off and get the skillet hotter. Cook each side for about 7 minutes per side or until cooked through. I also like to throw my buns in the same skillet, after the patties have cooked, and warm/char them up a bit. Smear the bottom bun half with lemon-basil aïoli and set a patty on top. Evenly spread 1/4 of the burrata on each patty. Set your bacon round on top, then the tomatoes, then the whole basil leaves and then put a healthy smear of lemon-basil aïoli on the top bun half. Rest the top bun half on top and let’s eat. Grab about 1,000 napkins. You’re gonna need it. I served these with oven fries. Preheat your oven to 450 degrees F and line a baking sheet with foil and spray with nonstick. 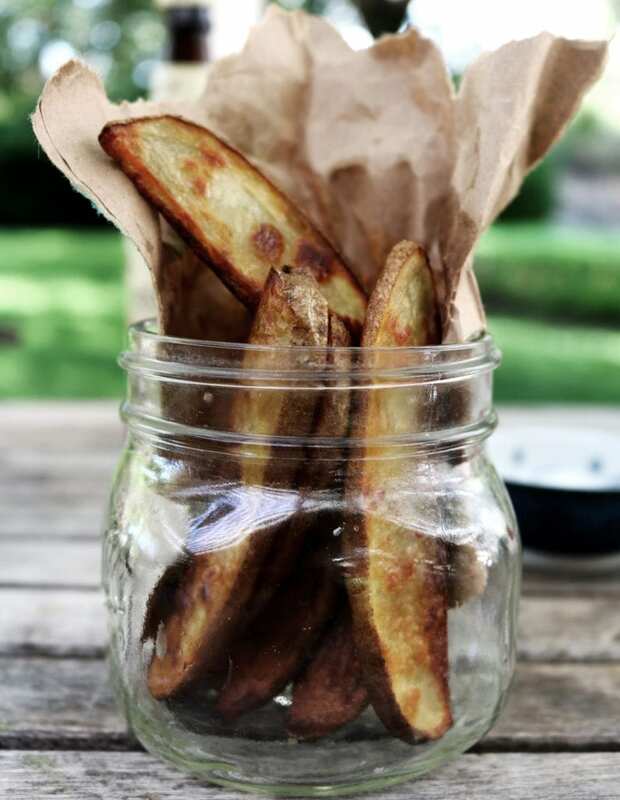 Cut potatoes into 1/4 inch thick wedges, lay in a single layer on the baking sheet and drizzle with olive oil. Bake for about 15-20 minutes and then flip with tongs and bake for 5-10 more minutes. I like them extra crispy and with a healthy sprinkle of sea salt. These, by the way, were DELICIOUS dipped in the aïoli. Have you all watched Bob’s Burgers? Ok, wait. Let’s take a step back. Have you watched Cartoon Network in the evening? Because I hadn’t. Until last week. It’s like South Park…for hours. Some of the cartoons are pretty raunchy. BUT, Bob’s Burgers is hilarious. If you ever watched Daria or can get into this type of humor, watch it. Seriously. I can’t believe The Night Of only has two more episodes? Right? Or is it one? Either way, I have no idea how they’re going to tie everything up and I’m already missing it. Did everyone enjoy the Olympics? Did you watch? Wasn’t Rio pretty? What’s your favorite sport? I think my daughter’s on her way to becoming a commentator because her knowledge of pole vaulting and high diving is astounding. I have zucchini coming out of my ears and I really want to make zucchini chips.I want crispy chips…do I need a dehydrator? Can I do it low and slow in the oven? Do you have any recommendations? I’m fantasizing about crispy zucchini chips with a creamy dill dip made with greek yogurt. Doesn’t that sound amazing?!?! I went wine tasting with my family the other day and MAN that was fun. No work, no parental responsibilities, just wine and snacks and laughing. We went to Presqu’ile, one of my favorites. If you’re ever on the central coast I highly recommend them…their Chardonnays and Pinot Noirs are just delicious. I’m on the eve of school starting. Seriously not looking forward to being back on a school schedule. Bed times, homework, drop off and pick up, sports…I need more summer. Happy Tuesday everyone. I hope you week is fill with laughter, hope + promise. Once again, you have me peeing my pants reading this post Rebecca! And drooling of course!! I think my son Sean desperately needs to take that Be Here Now class…like more than once!! I love everything about this burger. In fact, I’m not sure what I like best because it all just goes perfectly together. That bacon round, the aioli, the burrata! OMG! 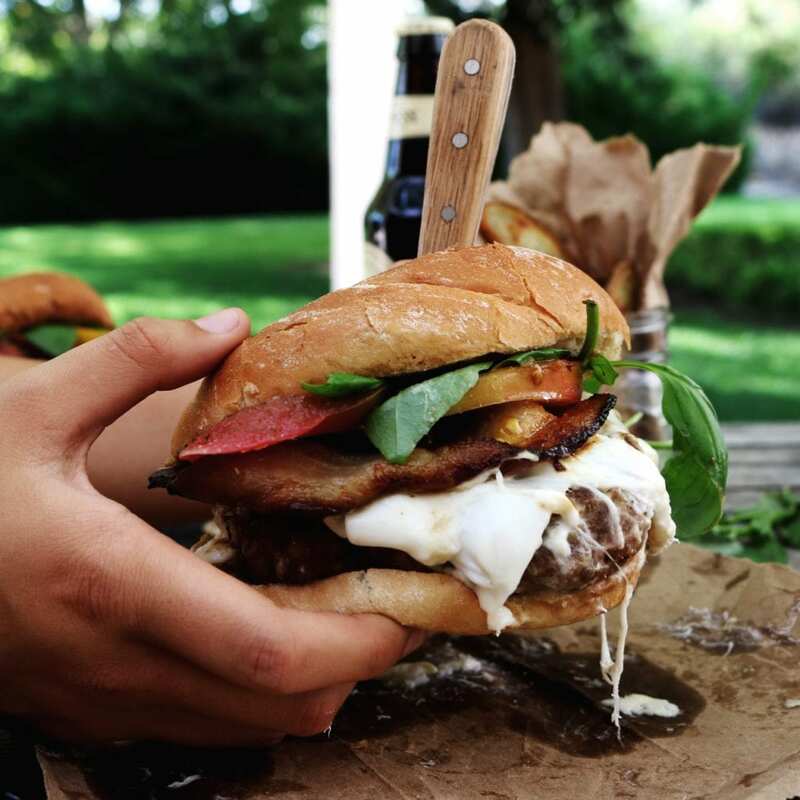 And there’s no better time to enjoy juicy, delicious burgers than during the summer! Thanks for sharing! 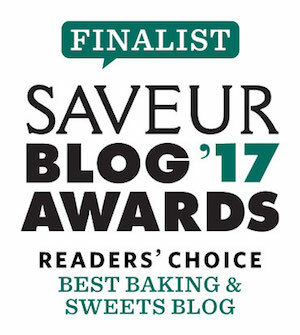 I love Alida’s blog too! 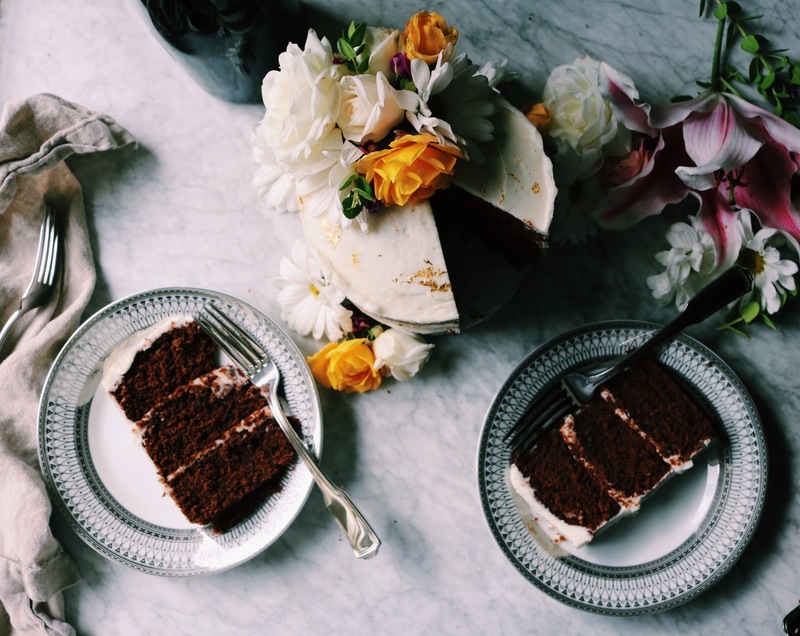 Her recipes are amazing and her photography is always stunning! Oh my gosh, this really hit a chord with me. I’m all about my lists but really need to focus on what’s most important. I have been known to write something on my list that has already been completed. What kind of kook does that? I find the beginning of school to be a reset for me and I’m already thinking about new workouts and meal planning. I also know what it’s like to have kids and be a blogger (three kids here). It’s exhausting and I often feel like I’m ignoring my kids for the benefit of my blog. That ain’t right! So I keep the same sort of plan where I work in the AM and then wander around aimlessly with my kids in the afternoon. Thanks for inspiring me to get my goals on paper! Your burger looks so tasty! 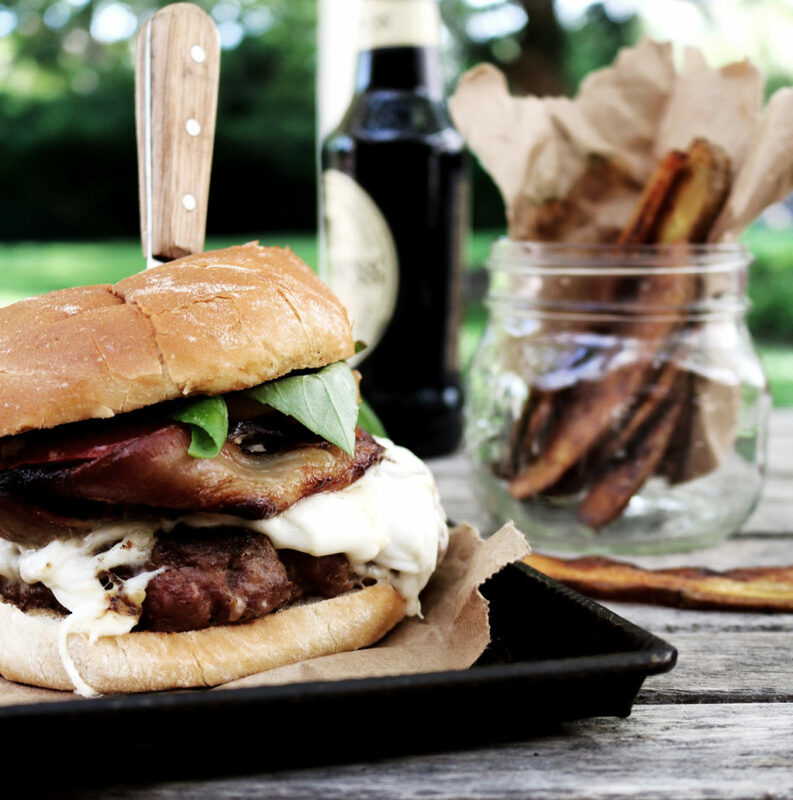 Digging the idea of adding burrata to a burger! Came from Alida’s blog and so happy to discover yours! Oh, you are too lovely. Thank you so much for being part of the collaboration. Your burger looks uh-mazing. That burrata though. Swoon. wait, mindlessly watching hours of housewives isn’t doing something? i seriously feel accomplished when i knock a couple of those off the dvr. and sadly i’m only half kidding. but i am with you on planning and lists. i sometimes add things to my list that i’ve already completed just for the satisfaction of crossing it off. and you have to be a little disciplined to stick to a regular blogging schedule for sure. i like your weekly meal planning idea. can’t wait to see what you come up with. and oh, these burgers!!! i’m going to head over to Simply Delicious to check out Alida’s, but yours will be hard to beat! I’m semi organized, but wish I was more so. I totally know what you mean about September is kinda like a refresh time. I find that there’s so much that I want to do or get done and there’s just not enough time in the run of a day to do it all!! Bob’s Burgers is awesome! Love that show and love reading the little menu board with all the crazy burger names. Wine tasting is where it’s at! How fun! Dawn…I have a deep new respect…Bob’s Burgers…you’re my peeps.